The Hebrew word for wonderful is pele, meaning “astonishing, marvelous, miraculous—a sight to behold,” as if your eyes have gazed into something that takes your breath away! 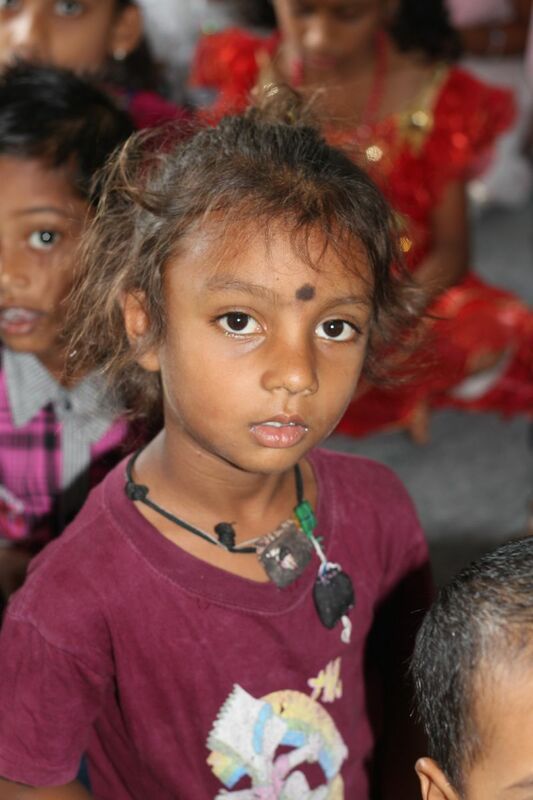 I love that word description for our Lord and Savior Jesus Christ because what He has done in the hearts and souls of children in India is nothing short of marvelous and miraculous. As I depart India and reflect on Jesus, our "Wonderful Counselor," it is emotionally and spiritually hard to catch my breath! 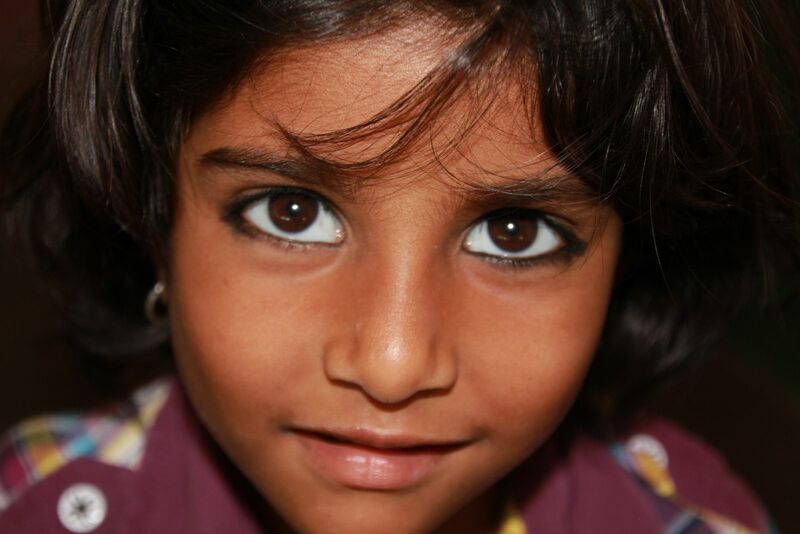 We just completed the 14th year of our India Children’s Ministry. Each year, the Lord astounds us with the fruits of His harvest. He has planted a field of seed on good soil in the midst of very sick and rocky ground. But He is the great Farmer of eternal souls and, from that field, He is bringing forth fruit for eternity. The ministry of growing young hearts into bright and faithful servants of God does not belong to us. Pastor JF and his team work faithfully throughout the year evangelizing, teaching, and nurturing the church of God in India—from the smallest child to the oldest man. How privileged we are to come in once a year and help with that ministry! Each year, the Sunday School teachers from Pastor JF’s church work alongside us as our translators and helpers. We were visiting with them one night before the work started, and there was excitement in the air—anticipation of the Children’s Bible Schools about to begin. We were talking with them about how long the ministry had been going on, and we asked them if they used to come to CBS when they were children. One young lady was 10 when we began the ministry with Pastor JF, and she said, “Oh, yes! It was like a festival week for us. It was our second Christmas!” Fourteen years later, she—and others like her—are translating for us and working alongside us with the love of Jesus Christ. In one of the village churches we visited, we were pleased to find Rajitha. She is a beautiful young lady who used to be in my senior class and later helped us with translating and teaching the children. She left Hyderabad for some time after her marriage, and we had not seen much of her. What a joy it was to walk into a village church and find her leading the singing with the children—and right in the front row were her own two children! I don’t care much for gray hairs, but I love having spiritual grandchildren! In the first village we visited, I taught an adult class on Moses and the proper use of the gifts that God has given to us. After the class, a young lady brought a baby to us for prayer. He was 4–5 months old. This baby was her fifth child, but all of her four previous children had died. She asked us to pray for him that God would—in His mercy—allow him to live and grow. Before we prayed, we asked for his name and she said she had not yet named him. This is typical in Indian culture, and she then asked us to give her baby a name. And so, in light of what we had just studied from Scripture, we named the baby Moses! God plucked Moses from certain death in the Nile River in order to raise him up as a servant of the Most High God. We ask that He would do the same for little Moses in India. Please join with us in that prayer. Everywhere we go and teach, there are some Hindus and Muslim children in attendance, but in some areas there are more than others. One morning, when we were doing village ministry, we arrived at “P” village after 3–4 hours of driving. We climbed out of the vehicle to be faced with around 250 children gathered on the porch of a primary school, packed in like little sardines in a steaming can! (Summers are very hot in India!) 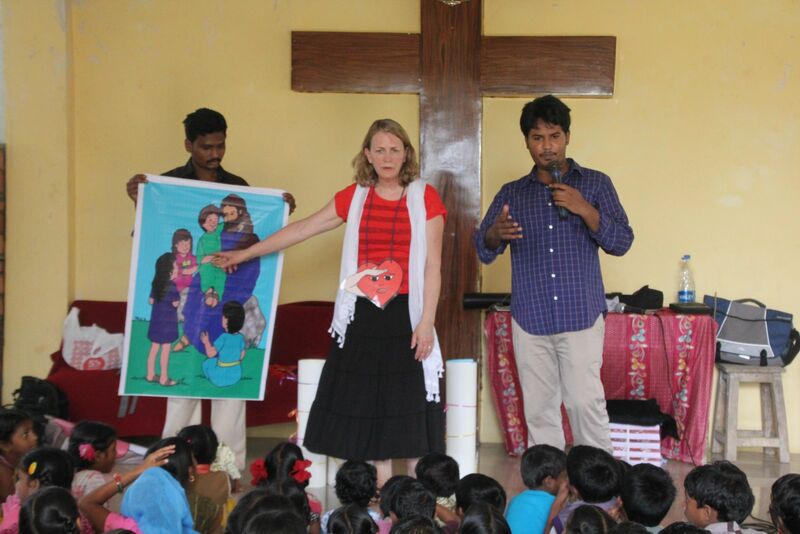 The pastor quickly told me that most were poor Hindu children, and my heart leapt with the opportunity to share the Gospel with so many young souls. 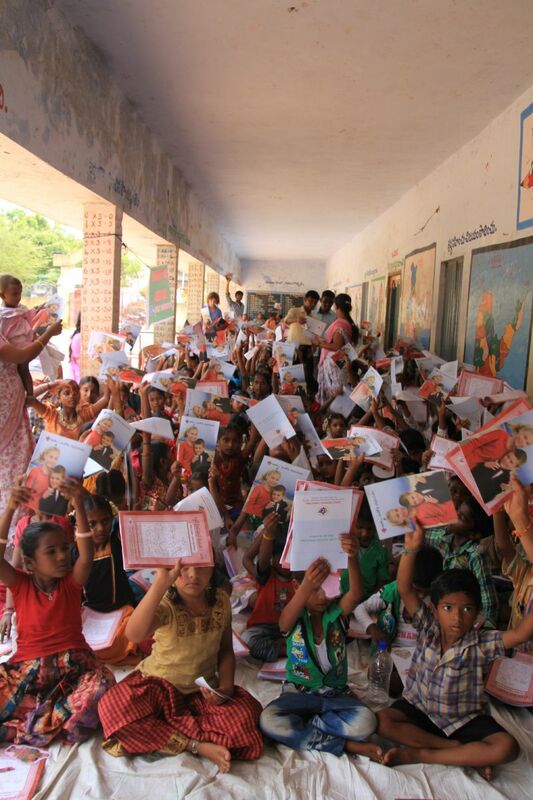 This year, through a special offering, we were able to print 5,000 Telugu and 3,000 English Gospel tracts for children. So, in addition to a face-to-face presentation of the Gospel, we were happy to distribute the Gospel tracts to the children at this village and all the areas where we taught. Please pray that the books going back into the homes would reach beyond the children’s hearts to those of mothers, fathers, and other family members. The child pictured here is from a Hindu family. You can see the “charms” around his neck. These are “blessed” by the idols and then worn for good luck. We see so many children like him—little boys and girls, young men and women who are being raised in families that only know idol worship. They are spiritual orphans in need of a clear and compelling Gospel message to introduce them to the Lord Jesus Christ and His kingdom. Mahesh preaches the Gospel of Jesus Christ under a tree in the village as they are without a church lot or building. Pray for this young man and his family, and for the growth of a Christ-centered church in this Hindu stronghold. Those of you who have been on our mailing list for some time will remember that Pastor JF’s eldest son Caleb was killed in a train accident in December 2012. Caleb was near finishing a five-year Bible College course when the Lord called him to eternity. His desire was to complete his training and work alongside his father in the ministry. When Caleb died, his younger brother Joshua was in the middle of a university engineering course. His plan was to help support the family financially while Caleb helped in the ministry. Just before we arrived in Hyderabad this year, Joshua finished his courses and obtained an engineering degree. However, the death of Caleb has changed Joshua’s heart. He now wants to go to Bible College so that he can take his brother’s place and help his father minister the love of Christ in India. Joshua is a fine young man and has always been very helpful to us in the Children’s Ministry there. This year, he did most of the translating for us in the villages. He would like to go to Bible College in the USA ,and BTBM is committed to helping provide a way for this to happen. If any of you would like to invest in this young man’s life and ministry, please contact us for details of particular financial needs. If you aren’t able to help financially, please join us in prayer for God’s direction and provision in this young man’s life. 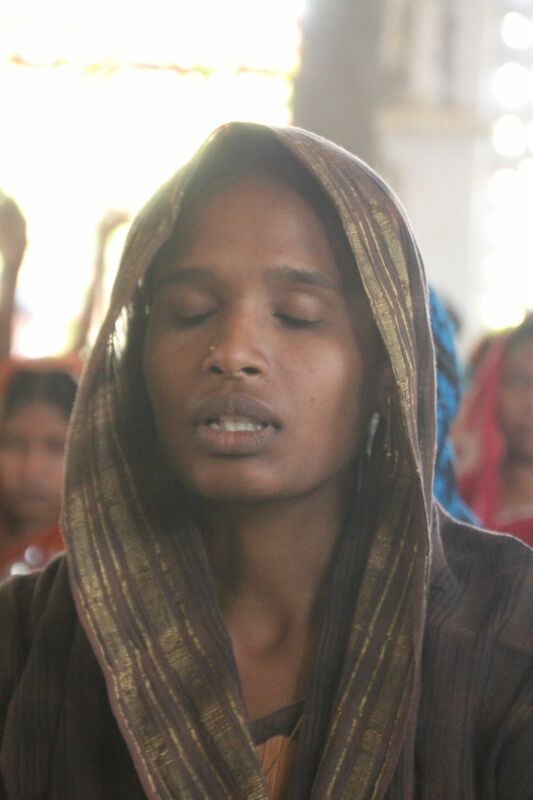 Please pray for the Christians in India. National and state elections were held across India while we were there. The party that gained control is not favorable to the freedom of Christians, and there is widespread fear of increased persecution throughout the land. Our brothers and sisters in Christ living in India struggle under the best of times, but this recent political change may increase their struggle. Pray accordingly. Working in India is one of the highlights of my year. There are many things I love about this ministry, but the teamwork involved is near the top of the list. This year, we had a small team of ladies actually going: Kim, Janet, Jeanie and myself. It was Kim’s tenth trip with me, Janet’s eighth, and Jeanie’s first! They were each a wonderful part of the team, and I am so thankful for their brave and faithful hearts and for the gifting with which God has graced them. They are my co-workers and my friends, and I value each one of them far beyond what I can express. Their families also sacrifice a lot in order for them to go. But the team goes far beyond the “boots on the ground” to the brave and faithful hearts of those who pray, print, laminate, cut, and help prepare. I’m also so grateful to those who faithfully give to supply the needs of this work, including little children who save their pennies, nickels, and dimes to help the little brown faces across the seas. I wish everyone on this extensive team could have seen with their own eyes the happy looks of children from cities, villages, and slums as they received truth, hope, love, crafts, snacks, books and—most of all—Jesus! It almost seems unfair that I have seen tens of thousands of these faces over the years when some of you have not seen one. One of the favorite visuals that we use in the ministry in India is a picture poster of Heaven that Kim’s daughter made for her. It is full of glitter and gold and, when Kim shows it to the children, they gasp in delight at the beauty of it. As I close this report, it is my honest prayer that Jesus, the “Wonderful Counselor,” would give each of you a glimpse of the eternal beauty your giving, helping, and praying have accomplished. May our amazing, astonishing, and miraculous Lord that we serve bless you, keep you, and take your breath away!